Salvatore Sciarrino, in league with the Neue Vokalsolisten Stuttgart, embarks on the investigation of a new ecology of sound, through a form of polyphony reduced to chamber-music scale. The lyrics selected by the Italian composer are based on six haikus by the Japanese poet Matsuo Bashô (1644–1694). A comprehensive explanatory text on the production is contributed by Max Nyffeler. 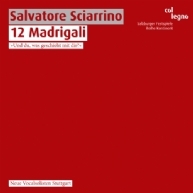 The world premiere of the work was recorded at the 2008 Salzburg Festival and is now made available on CD for the first time by col legno! „A composed program“: the one-time portrait concert in honor of György Kurtág brought together a group of unique artists at the Salzburg Festival in the summer of 1993. The unspeakable evil in three nameless acts: We proudly present Salvatore Sciarrino’s Macbeth, recorded at the 2011 Salzburg Festival, released for the first time as an audio document!